A TV show I enjoy tuning into is Restaurant Impossible. 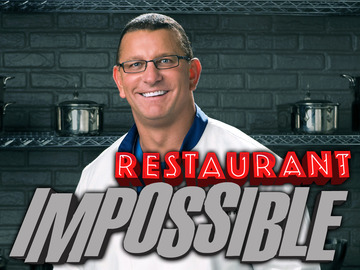 To those who may be unfamiliar with it, the show revolves around all-star chef, Robert Irvine (pictured to the left), who goes to failing restaurants and tries to save them in two days with a $10,000 budget. This often involves improving customer service, redesigning menus, improving kitchen cleanliness, improving marketing, and/or redesigning restaurant. One of the patterns I have noticed on the show is that many of these failing restaurants have filthy kitchens. But last week, I saw the most extreme and appalling version of filth when I watched the episode called “Anna Maria’s” in which Chef Irvine tried to fix a restaurant that bears this name in Dumore, Pennsylvania. Among the problems noted during the show were a) layers and layers of food and grease covering stove tops, pots, overhead vents, and kitchen appliances (which included a pot on the stove that was caked in so much black grime it looked like something you would find in a dungeon); b) bacteria, slime, and old food on the floors, and behind/under/on restaurant equipment, c) filthy refrigerators with open containers of food, and c) a basement with food (e.g., flour) stored next to chemicals. Of all the shows, I never saw Chef Irvine so upset. He nearly vomited in the kitchen on screen and suggested that he actually did vomit later in the show. I could go on describing the horrors of this kitchen but you really have to see the show to believe it. The advertisement for the show on my DVR said that the kitchen had not been cleaned in about 25 years. I am not sure if that was hyperbole, but regardless, the kitchen clearly had not been cleaned in a long time. When I heard this and saw the state of the kitchen, I was shocked and upset that the government could allow a restaurant to continue to serve food to the public like this and put them at risk of food poisoning (e. coli). But I was even more shocked when I read an article stating that the restaurant actually passed a health inspection nine months prior. The restaurant owner’s son claims that the Food Network exaggerated the state of the restaurant for the purposed of TV. While I am fully aware the not everything on TV is how it seems, it simply stretches all credulity for me to believe that the Food Network planted the dirty pots, coated the kitchen equipment with bacteria-laden slime, made the refrigerators filthy, planted old food behind equipment, and brought food in the basement to put it next to chemicals. There is too much evidence the other way, such as that a) the chef (Rudy) said on camera that the kitchen had been in that condition for four years, b) the owner and her son allowed Irvine to send customers home after he tossed out a filthy stove vent for them to see, c) the owner and son admitted that the kitchen had fallen into an embarrassing state, d) the show normally does not spend this much time focused on kitchen clean-up needs, e) no one has sued the Food Network over false presentation, f) Chef Irvine genuinely appears to want to help people, and g) the visual evidence of the state of kitchen clearly indicates this was a process that took a very long time to create. It is all too easy to blame the Food Network for exaggerating the state of restaurant as part of some type of conspiracy theory. How about two alternative and more parsimonious explanations: 1) The restaurant owners are embarrassed and understandably concerned that no one is going to come to their new restaurant after seeing an expose of it on television (which is a public relations disaster) and so they blame the Food Network for exaggerating it as a form of damage control; 2) The Health Department is not doing their job. Explanation number one does not need a further explanation, but consider number two a bit further. Not only did this restaurant pass health explanation nine months prior, but not a single violation or risk factor was found. How can that possibly be true? It is possible that the inspection was either never done but signed off on or that an inspector signed off on the report knowing there was a deficiency. Why would that be? Sometimes, restaurant owners have political connections with health inspectors that allows the process to be circumvented. This is more likely to be the case in small cities such as the one this show was filmed in. All in all, I now have no confidence that health inspections mean anything and have become increasingly careful about the types of restaurants I frequent, preferring to go to ones with an open kitchen that I can see for myself or ones where I can peak into the kitchen. If I cannot see the kitchen, then I use proxy indicators such as how clean the bathrooms are, floors, tables, walls, ceilings, the dining ware, the staff, and the food as an indicator of the state of the kitchen. State, county, and city governments need to revisit the health inspection process to make reforms so that the process works as intended and the public can once again have confidence in how the system works. I also believe there should be a law that allows customers to view the kitchen of restaurants before placing an order.